Aerial firefighting was first employed to minimize damage from napalm attacks during World War II. Following the war, many more potential uses were investigated. Recently, aerial firefighting has proven to be quite effective in fighting wildfires. As techniques are refined, aerial firefighting has proven flexible in many situations and adaptable to different types of aerial equipment, spelling good news for areas like California and Colorado, which have been devastated by widespread wildfires in recent years. 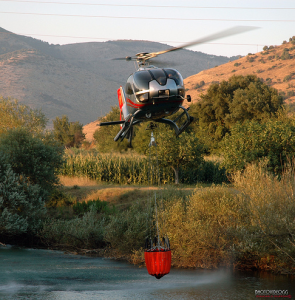 The American Helicopter Services and Aerial Firefighting Association (AHSAFA) reported that the demand for its aerial firefighting services is so great that contracts are being issued even to operators of single helicopters or small planes. If you are currently pursuing a fire science bachelor degree, there is a promising amount of growth in this area of firefighting for new graduates to explore. 2 Who Are the Largest Employers of Aerial Firefighters? 4 Who Is a Good Candidate to Become an Aerial Firefighter? Aerial firefighting uses aerial machinery such as fixed-wing aircraft, air tankers, and helicopters. Professional rappellers and smokejumpers, who use parachutes to drop from aircraft into the thick of fires, are also considered aerial firefighters. Aerial firefighting, while a rewarding career path for anyone pursuing an emergency management masters degree or similar education, is inarguably dangerous. The risk is mitigated by increasingly stringent safety protocols, better pre-mission ground briefings, more long-term contracts to help teams become comfortable working together and following consistent protocols, and the use of a variety of protective gear. As well, there are more courses and certification programs that can help aerial firefighters stay current on the latest safety protocols. Who Are the Largest Employers of Aerial Firefighters? To date, the single largest employer of aerial firefighters is the United States Forest Service (USFS). Other employers include the New York City Police Department Aviation Unit, various branches of the military, the federal government and many local police departments. Also, many active aerial firefighters work as independent contractors for these larger departments. Some paramedic organizations also maintain a number of professionals on staff who hold credentials in aerial firefighting to help in search and rescue missions. Although aerial firefighting had a rocky start, when the first aerial firefighters experimented with dropping water bombs from fighter planes, the profession has come a long way since that time. Today, aerial firefighters are highly trained professionals. Many hold bachelors or advanced degrees in fire science or emergency management, and all who fight wildfires are required to be certified in wildland firefighting. In most cases, this involves applying for a “red card,” or Interagency Incident Qualification Card, and passing a written exam before being certified. Many paramedics and medical technicians work with aerial firefighting squads, as their skills are invaluable in emergency situations where fatigue and oxygen deprivation are two of the greatest career hazards. Because requirements vary from state to state, it is important to check with your local fire department to see what level of education and certification they require. The most successful and well-paid aerial firefighters often continue to gain training and education throughout their career. Additional certifications can include helicopter and small plane pilot licenses, chainsaw licenses, degrees in fire engineering, management and training skills. Who Is a Good Candidate to Become an Aerial Firefighter? If you are disciplined, team-oriented, have a solid aptitude in math and science, and you have a passion for the wilderness and the environment, you are an ideal aerial firefighter candidate. About the Author: The field of firefighting is changing with the times, and when Kent Curtain heard that aerial firefighting is being taught to degreed fire-science students, he knew he’d found a career with the perfect blend of challenging and meaningful work.